I hope you all had a wonderful Christmas!! As I get older I realize just how magical this season truly is, when it cancels out all other priorities in life and causes everyone to be home, together. Pretty much forces you to realize what matters most here. Sigh. What a wonderful way to celebrate the birth of our Savior. I definitely felt more adult pressure this year though. Never before have I been solely in charge of granting one person’s Christmas wishes and it was a stressful endeavor. (shout out to all parents everywhere for making this happen for multiple people, right now I can’t even fathom.) And with the job of packing up all our worldly possessions in preparation for our move next week, it’s been pretty busy! One of the saddest things about moving for me and Tayler is that 90% of both of our families live within an hour of us now. We are gonna miss all those nieces and nephews so much! How will we stave off the baby hunger now?! But since everyone is conveniently home at this time of year, we took advantage for one last hurrah. First, after an ice skating attempt ended in tears (ok I was the only one upset. But really is it so hard to update your online schedule?!) we ended up going to Nickelcade instead, which was probably better because the ice rink was looking like that one viral picture of the swimming pool in China. Turns out the only game I’m good at is the one where you shoot water out of a banana to make the monkey paddle faster. Someone please relate that to a valuable life skill for me. 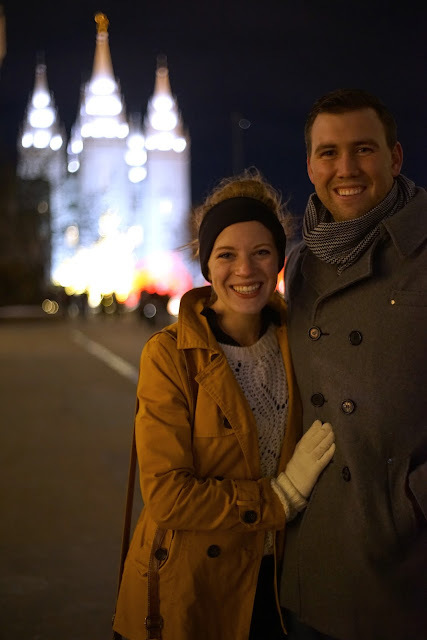 We really wanted to visit some of our favorite places before we leave this good state, so the Salt Lake Temple was our next target. Frontrunner is great to avoid parking, and since we were buying group pass anyways we expanded our twosome and invited Tayler's sisters cute family. 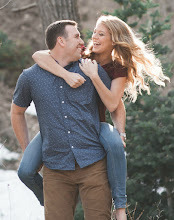 Aren't they the cutest. 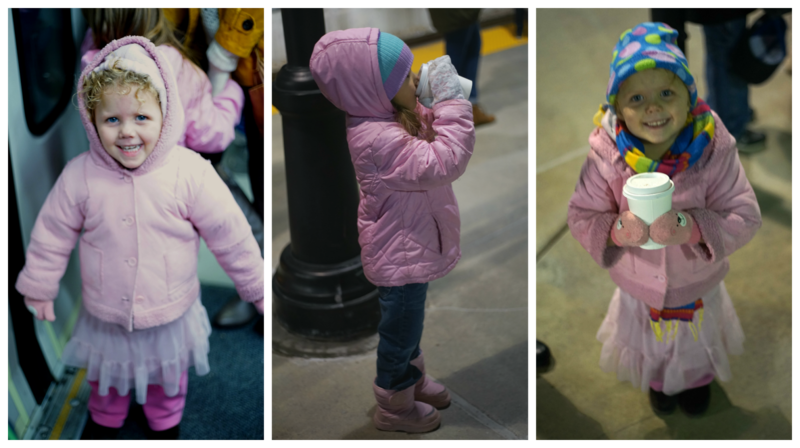 Lydia could hardly put her arms down with all her layers. 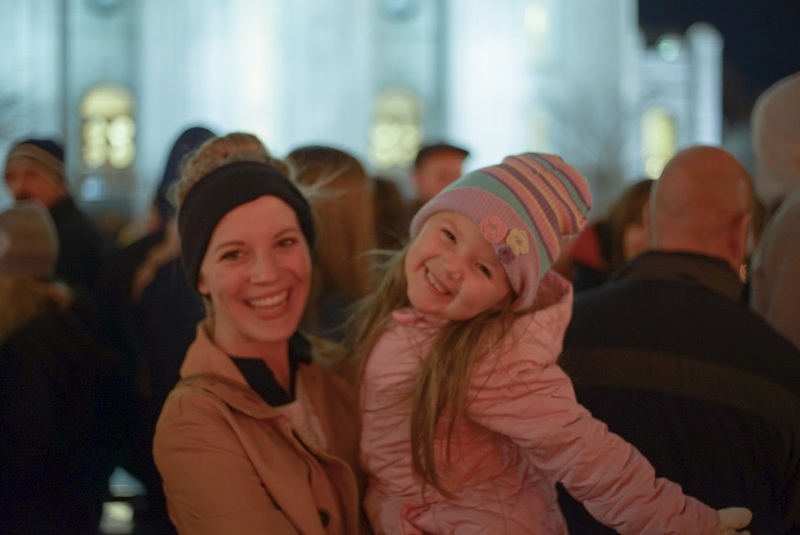 And for once in my life, I was warm at the Lights at Temple Square. It was a Christmas miracle. Don't know why it took me this long to figure out you just have to wear two pairs of pants, two long sleeve shirts, thigh high socks, a coat, gloves and a headband and you're positively balmy. Star Wars had to make it in the break somehow, so on Christmas Eve our family got together and went. 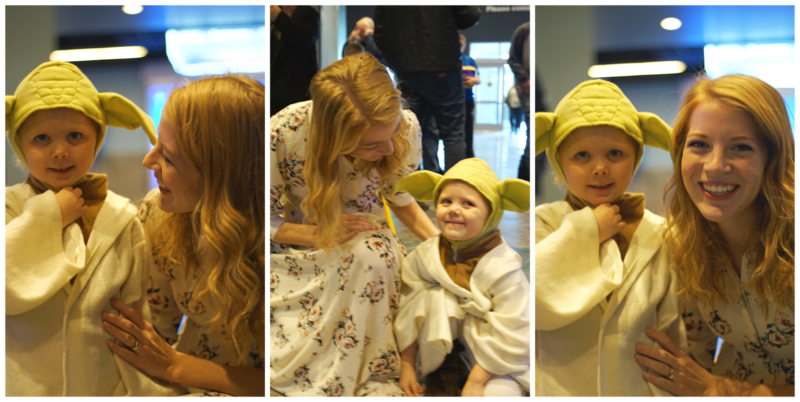 My cute nieces and nephews dressed up, and Yoda was the only one willing to take a picture with me. I’ll take what I can get. Gingerbread (hashtag graham cracker) houses have always been a Christmas Eve tradition for the Crook family, so it was fun to have Tayler assist me in the building of our humble calorie filled cabin. It’s actually remarkably close to the size of our apartment now, so we gave ourselves points for accuracy. And then it was Christmas morning! Neither of us slept very well, partially because Tayler woke me up at one in the AM to tell me he forgot a present at his parent’s house and he’d be back soon. Whenever I’m woken up I turn into this mumbling emotional thing, so I got real clingy real quick. He came back thirty minutes later but I kept waking up in a panic thinking that he'd slipped off the road into a ditch somewhere. Anyways, turns out he was stealing hashbrowns from his parents so he could make our Christmas Quiche while I was sleeping so it’d be ready to go in the morning. Bless him. And now since he made it he has to keep making it in the name of tradition right?? It was really an incredibly sweet gesture. 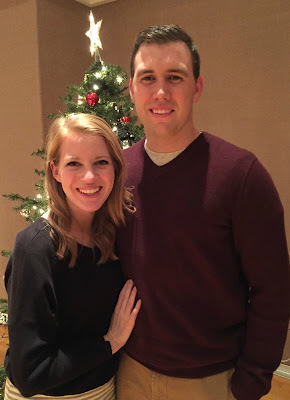 Christmas as a newlywed was different. It was cute, it was special, it was incredibly patient as we went “ok your turn” back and forth. No whining, no complaining, a whole lot of “awe thanks babe’s, kiss kiss” and we were done! It was a lot shorter than what I expected, so after we took a nap, the only thing to do! Haha it was a lovely, quiet and peaceful Christmas.